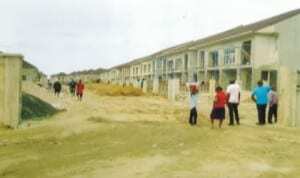 Rivers State Golf Estate under construction, one of the public-private partnership projects. wellbeing of the people is the determinant factor in the general development of a state or nation. In this interview with Lilian Peters, the Executive Director, Bureau of Public-Private Partnership (BOPPP), Rivers State, Mrs Anita Laz-Nwokeafor x-rays the economic realities of the state. What actually is Public-Private Partnership. This means the various arrangements between the government and the organized private sector to enable both parties to systematically set out objectives to be achieved within a set time. The key components in the arrangements are that there is the beginning and an end; a defined budget on which the finance, normally 100 per cent, are agreed and achieved before the project begins; specification and standard which both parties must agree on before the project begins. So in the PPP project, the technical, financial and social/economic terms of the transactions are all spelt out before the inception of the project. You said that no portfolio contractor is given a PPP project, are you now saying that PPP projects are not for political settlement? No, no, no, they are not. We must understand that democracy allows you to do something. Democracy means government of the people, by the people and for the people. PPP is about governance, accountability that allows you to reach out to the people. Political settlement doesn’t work in PPP because there is a law that guides and regulates the operations of the parties. In this case, it is called the “Rivers State Public/Private Participation in Infrastructure Development Law,” It limits what both the state and the private sector can do. There is also a regulation over our head and because there is regulation over what we can do, it brings us back to the social arena where all of our transactions must be transparent. Has the introduction of PPP in any way contributed to the improvement of Rivers State economy and how? For us in Rivers State, our PPP agenda is driven by the need to create employment and impact the people. We get so many proposals on our table but for each project, we ask ourselves what the state and the people stand to gain with the project. In PPP projects, if we put one dollar, the private sector puts four. We ask ourselves: what wealth it would create for the people because government believes in wealth creation for the people. We also believe that except we have a sustainable development, we can never grow as a state. It is also important that we put infrastructural development and project that will not depend on government or Governor Amaechi. What we do here is to put in place a framework for long term sustainability taking into consideration the economic, financial and environment impact of those projects and we ask ourselves: if we look back 15-20 years, what we will see in the projects? How many are employed there now? As I speak to you, Ubima has over 1,000 workers. This is why you have not witnessed any trouble coming from there because there is hardly any young man from there that has nothing to do. We chose agriculture because that is one sector that one will not require Bachelor of Arts (BA) degree to work. Also, with modern technology, agriculture is advanced and not the type that our grand parents did. We have the processing, packaging, storage units and I mean, it is a sector that if well developed will employ 30% of Nigerian youths. That is what research has shown because Agriculture is the key to a sustainable development of Nigerian economy and carries the processing of different skills and units. Can we look at the Peace Park, for seven years now nothing has happened there, what do you think is responsible for this waste of time and space? I don’t know about seven years, all I know is that in October, 2013, the Rivers State government signed a concessioning to build the Garden City Gallery on the park. What we chose to have there on the Peace Park was a shopping mall on about seven hectares, a four star hotel and a Children’s Park. That project is on-going and has passed a financial closure. As you can see, they have cleared the ground, the developer has moved to site, we are in the process of tidying up the paper work. We have the issues of alignment and we are working with the airport and the army. That is where we are. Why is the project delaying compared to other PPP projects? No, there is no delay, in a relative development, one will need some time to tidy up and get started. To what extent do you think the PPP project has infused local content. Of course, all our projects are delivered by local content. At our farm project, tabouren local, I am not sure that there is a project that has so much local content than the Golf Estate on Peter Odili Road. When we signed the contract, they were going to bring Chinese builders to build. They felt that the Chinese builders will come and do their technology work and so teach the indigenous builders but they were shocked that we have talented builders in the state. More than 80 percent of the builders there are Rivers indigenes. The best builder there is an Okrika boy and those are the things we want to project. Government is a big brother who has good negotiating power and strength which can attract big developers. We have been able to bring in a developer from Gambia that has built all over Africa. Our local contractors have fused in and learnt from him. You can go and see for yourself what the local contractors are doing there. As I speak to you we have over 250 youths from the community working with the boys they brought for tiling to make sure our people learn from them, it is working out. I can boldly say that the local content has key effect on PPP project. The government leased some property to some companies like Silver Bird, Park ‘n’ Shop and others for 35 years, do you think that this action would impact on the economy of the state. when Governor Amaechi came into government, he realised that some of the strategic government assets were lying fallow. You had a great asset like the one you mentioned, SUPABOD strategically located beside Government House along Azikiwe Road. As a matter of fact, that SUPABOD used to be the pride of not just Rivers State but Eastern Nigeria, as people came from Enugu to shop there. It was the only shop in the Eastern Nigeria with escalator. Over the years, due to government mismanagement and inconsistencies in polices, the facility could no longer meet up its obligation. It is worthy to note here that the facility was having over 400 work force directly outside their suppliers. The governor now decides to lease it on a long term basis to the organised private sector on concessioning, because the private person would use his/her money for the building and even employ our people and their people to work for them who will live in Port Harcourt, pay house rent and buy things in our local market. This will in turn affect the local economy. At the end of the 35 years, what happens? We’ll have our property back with the building. When there were no computers, people were keeping records, not to talk of this digital age where everything is properly documented. There are other projects like the fish farm, the plantain plantation in Ogoni and others, what are the contributions of these projects to the economy compared to how it was before the inception of the present administration. The issue is that there was the need to create employment and also expose the people to modern agricultural technology where the rural people will handle different sections. This actually will stop rural migration and also provide dignity of labour which provides satisfaction. The people cannot touch their government directly but with PPP project, they feel government’s impact. Another good example is the fish farm at Buguma. I know that these projects will be sustainable because it is driven by the private sector whose funds are involved in the projects. What has been your contribution in the housing sector and why are civil servants not benefiting from it? This is one sector that is at the centre of the governor’s heart. The government is interested in getting affordable houses for public servants. We have had two challenges in this respect. One is acquision of large lands for building project. When government want to acquire like 100 hectares of land for that project, the owners who see government as money bag would want us to pay through our nose. Secondly, the only area you can acquire such land is at the outskirts of the towns. The issue is with the challenges associated with the acquisition of land, we are careful about the project we put on the land. But government is trying to work out the modalities of trying to acquire a land at compensation cost and embark on this lower cadre housing project. There is the need to encourage private sector participation in lower cadre housing projects. Are you saying that there is a plan to that effect? Yes. We have been in touch with Mrs Cookey-Gam of Greater Port Harcourt and even Head of Service on how to work out the modalities for a blend in this area. How do you see the development of Greater Port Harcourt in terms of the economic situation of Rivers State? The work you are seeing being done today, six years from now if you look back, you will marvel at the tremendous speed with which the city will explode, you will now understand that without such work, it would not have been possible. What we are trying to do is what the British did in Port Harcourt years back when the city was not yet populated. We are starting afresh in the development of infrastructure, planned water, road and electricity as well as industrial zone and housing. The way the British did it in 1936 which has remained many years after, is what we are trying to do. It will be a tremendous boost to the economy of Rivers State, most especially because it is located right opposite the international airport. So long as we enjoy political stability where we will continue to attract a certain level of international development fund, we will see tremendous growth. Business is all about making gains, so in PPP projects, does government make gains. For PPP projects, business is not all about the money but the people. What we try to do as government is to see how we can provide a better life for the people. The only thing the money has done for us is to empower us to negotiate in better terms with our partners.